Reference material about some of the awards and recognitions (other than rank/merit badge advancements) available to Scouts. Additional information on awards and recognitions offered by the Boy Scouts of America please visit the Awards Central website. Arrow of Light: dults who earned the Arrow of Light as a Webelos Scout can wear this square knot on their uniform. Eagle Scout: Adults who earned the rank of Eagle Scout can wear this square knot on their uniform. Quartermaster Award (Sea Scouts): Worn by Adults who have earned Sea Scouting's highest award as a youth. Summit (Venturing): This knot is given in recognition of attaining Venturing's highest rank, the Summit Award. If you earned your Summit Award when you were a Venturer, you are entitled to wear this knot. William T. Hornaday Award: The William T. Hornaday Award recognizes Scouts, Venturers and Scouters for their service to conservation and ecology efforts in their communities. To earn the Hornaday Award as an individual, youth members must earn a series of merit badges followed by a concentrated series of conservation and/or environmental education projects to be conducted in the member's community or nearby, under the advisement of a trained conservation, naturalist, or environmental engineering expert. Youth Religious Emblem: To encourage members to grow stronger in their faith, religious groups have developed the following religious emblems program. Emergency Preparedness BSA: The emergencies of today's world demand more than ever that our young people and adults be trained as individuals and as units to meet emergency situations. This program fosters skills in our youth and adult members so that they can participate effectively in this crucial service to their families, communities, and nation. Conservation Award: The Conservation Good Turn is an opportunity for Cub Scout packs, Boy Scout troops, Varsity Scout teams, and Venturing crews to join with conservation or environmental organizations (federal, state, local, or private) to carry out a conservation Good Turn in their home communities. Ready & Prepared Award: The BSA Ready & Prepared Award was developed to encourage and reward Boy Scout troops, Varsity Scout teams, and Venturing crews that incorporate safe practices while enjoying challenging activities. Leave No Trace: Leave No Trace is an awareness of our impact on the environment that teaches us to respect the rights of other users of the outdoors as well as future generations. The National Outdoor Achievement Award: This award recognizes Boy Scouts/Varsity Scouts that excel in outdoor participation. The award consists of five areas of emphasis (camping, aquatics, hiking, riding and adventure) with rigorous requirements to earn each segment. For Scouts looking for an extra challenge, the National Medal for Outdoor Achievement. This challenging award requires earning at least three of the National Outdoor Achievement segments, planning and leading a trek, earning Wilderness First Aid and becoming a Leave No Trace Trainer as well as several other requirements. Keep America Beautiful: The Hometown U.S.A. Award is a joint program between Keep America Beautiful Inc. (KAB) and the Boy Scouts of America. It is designed to give recognition to the outstanding efforts of Scouts in their communities in regard to citizenship and environmental improvement. Special Awards/Honor Opportunities: Boardsailing, Cyber Chip, Den Chief Service Award, 50-Miler Award, Firem'n Chit, historic trails award, interpreter strip, kayaking, mile swim, nova awards, paul bunyan woodsman, sucba, snorkeling, stand up paddleboarding, totin' chip, and others. Scouter's Training Award: The criteria involves the proper training, tenure, and performance. 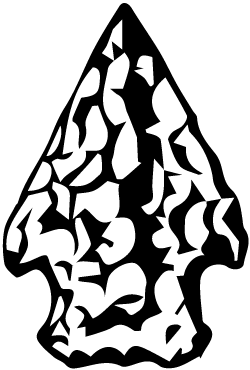 If someone fulfills the requirements for this knot in more than one program area they may wear a device on the knot to distinguish how the award was earned. Scouter's Key: This knot is earned by serving in Boy Scouting, Varsity Scouting, Exploring, Commissioner Service, and District Committee positions. Additional training, tenure and performance is required. The appropriate device may be attached to the knot. Unit Leader Award of Merit: The Unit Leader Award of Merit replaces the Scoutmaster Award of Merit, the Varsity Team Coach Award of Merit, and the Venturing Crew Advisor's Award of Merit programs. This new recognition has revised requirements and may be earned by Cubmasters as well. It is earned after completing the requirements and being nominated by the Unit Committee Chair. Trained Strip: Leaders who have completed required training can wear this patch. See the Training page for more details. Wood Badge: The ultimate leadership training experience designed to meet the leadership needs for all Cub Scout, Boy Scout, Varsity Scout, and Venturing leaders as well as Council and District leaders and Scouting professionals is waiting for you. Philmont Training Center Masters: This is a three track program. When a Scouter has completed the the first track, he/she would earn a Philmont Training Center Conference Patch. After completing the second track, the Scouter would earn the square knot. By completing the third track the Scouter would earn the PTC square knot device. Professional Training Award: This award is for professional Scouters. It requires four years of service, three levels of professional training and performance levels set by Professional Directors. Distinguished Commissioner Service: This is additional recognition for all levels of commissioner service. This is additional recognition for all levels of commissioner service. Doctorate of Commissioner Science: To recognize completion of a standardized program leading to the completion of a thesis or project and the award of the Doctorate of Commissioner Science from a College of Commissioner Science. Arrowhead Honor: This award is for successful completion of the Arrowhead honor. Honor Medal: Awarded to a youth member or adult leader who demonstrates unusual heroism and skill in saving or attempting to save a life at considerable risk to his or her own. In cases of exceptional skill or resourcefulness and extreme risk of life, the medal is awarded with crossed palms. Heroism Award: Awarded to a youth member or adult leader demonstrating heroism in saving or attempting to save a life at minimum risk to self. Medal of Merit: The Merit Medal honors Scouts, Venturers and Scouters that have performed some act of meritorious service above and beyond what is normally expected of a youth or adult member of the Boy Scouts of America. Key in the difference between this award and the heroism awards is that the action need not involve saving life, but must employ some aspect of Scouting learning or skills in the execution. District Award of Merit: This is the highest honor that a district may bestow on a Scouter. Leaders involved at any level of scouting or in a program are eligible for nomination. Recommendations are reviewed by a district committee to determine who should be granted the award. Silver Beaver: The highest honor that a council can bestow on a Scouter. Leaders at any level or any program are eligible. Nominations are submitted to the local council committee for consideration and approval. Silver Antelope: The highest honor that a region may bestow on a Scouter. Leaders that have rendered exceptional service on a regional basis are eligible. Nominations are submitted to Regional Scout Offices for consideration and approval. Silver Buffalo: The highest honor that the National Council can bestow on a Scouter. Leaders that have rendered exceptional service on a national basis are eligible. Nominations are sent to the BSA National Offices for consideration. Silver World: The Award is a distinguished service award similar to the Silver Buffalo, Silver Antelope and Silver Beaver. It is given for distinguished service to youth and cannot be applied for. It is presented to world citizens who give outstanding service to youth on a national or international basis. Recipients must be countries whose Scout Associations are members of the World Scout Conference. Members of the Boy Scouts of America are not eligible to receive this award. Distinguished Eagle Scout Award: It is awarded to an Eagle Scout for distinguished service in his profession and to his community for a period of at least twenty-five years after attaining the level of Eagle Scout. Other requirements include significant accomplishment in one's career and a solid record of continued community volunteer involvement. 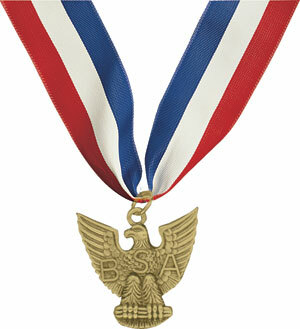 It is the only BSA award given to adults that is dependent upon the recipient's association in the BSA as a youth. Whitney M. Young Jr. Service Award: hose who work to promote Scouting among low-income, inner city and rural youth may be recognized with this award. It is named after the late civil rights advocate. Asian American Spirit of Scouting Service Award: The purpose of the Asian American Spirit of Scouting Service Award is to recognize outstanding services by an adult individual or an organization for demonstrated involvement in the development and implementation of Scouting opportunities for Asian American youth. ¡Scouting...Vale la Pena! Service Award: The purpose of the ¡Scouting…Vale la Pena! Service Award is to recognize outstanding services by an adult individual or an organization for demonstrated involvement in the development and implementation of Scouting opportunities for Hispanic American/Latino youth. Adult Religious Award: Worn by Adult Members who received a Religious Award Emblem as an adult. BSA Alumni Award: for registered alumni. If you or someone you know is not registered, it only takes a few minutes. The BSA's definition of alumni is, "everyone positively and personally impacted by the Boy Scouts of America-former Scouts, family members of Scouts past and present, volunteers past and present, community leaders, and the millions of Americans who benefit from Scouting in their communities every day." William D. Boyce New-Unit Organizer Award: The William D. Boyce New-Unit Award recognizes volunteers who organize one or more new traditional units. Celebrating Boyce's organizing spirit, the award consists of a silver square knot on a background of yellow, green, and red - representing the traditional Scouting programs' colors. Contact your District Executive if you qualify for this award. George Meany Award: his knot can be bestowed on unusually effective Scouters who are labor union members. International Scouter Award: his award encourages Scouters to broaden their involvement in Scouting through participation in world Scouting activities and recognizes Scouters for their contributions to world Scouting. James E. West Fellowship: his award is presented to individuals based on a contribution of $1,000 or more to the local Council's West Fellowship Fund. Community Organization Award: An award to honor individuals who are members of civic or fraternal organizations (such as Elks, Lions Club, Rotary, VFW, etc) who strengthen the relationship between Scouting and the organization. 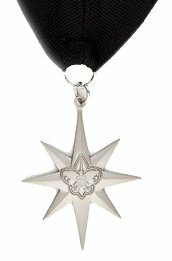 Order of the Arrow Distinguished Service Award: This award is presented to an OA member who has rendered unusual service to the order on a national basis. William H. Spurgeon Award: Individuals who render distinguished service to Exploring may be honored with this award. North Star Award: High-level award presented by councils on the behalf of the National Court of Honor for nonregistered volunteers who have made a significant contribution to Scouting; on same level as the Silver Beaver Award, which is for registered volunteers. Veteran Award Application for recognition as 5-, 10-, 15-, 20-, 25-, 30-, 35-, 40-, 45-, 50-, 55-, 60-, 65-, 70-, 75-, or 80-year veterans of the Boy Scouts of America.